Ever wonder if there really is a bar like “Cheers”? The sitcom was more or less modeled after a real bar in the Boston area, or so I remember. But here in the Twin Cities, we have our own Cheers, only this one also happens to be one of the finest venues for jazz in the country. At the Artists Quarter in St. Paul, they remember your name. And really, they are always glad you came. Owner Kenny Horst can always use the business. It’s been a labor of love to keep the musician-friendly, serious listening preferred bar and jazz room going, now in its third or fourth location (I lost count). Like the basement Village Vanguard in Greenwich Village, the AQ sits below ground level, no kitchen (although you can bring in or order from a neighboring grill or brew pub), and the bar offers the basics--don’t ask for a latte or Glenlevit. Like the Vanguard, the audience is mostly interested in the music and there’s an expectation that indeed, you are there to listen, not shout over the drums and horns. Unlike the Vanguard, most of the talent is home grown and relatively unknown outside of the Midwest. Yet that’s hardly a drawback given the quality of the local jazz scene. Kenny does book a great national act nearly monthly—Roy Haynes, Lew Tabackin, Mose Allison, Eric Alexander, Lee Konitz have all been through in the past year. But usually we’re paying very little to hear Laura Caviani, Dean Magraw, Pete Whitman, Phil Hey, Chris Lomheim… the list is thankfully too long. And unlike the Vanguard, your host Davis Wilson is “pleased and flipped” to chat with you about most anything; and the room, though hardly filled with designer furnishings, is as warm and inviting as your den… unless of course you are sitting under that vent! Irv missed the AQ bash this year. 88 and he was double booked! But the rest of his band (Phil Aaron, Tom Lewis and of course Kenny Horst) was on stage and by midnight they were joined by guitar whiz Dean Magraw, giving Carole and Dawn all the support they needed to sing the rest of the night away. Davis was minding the door as always, talking about upcoming gigs and politics. Johanna played Coat Check Girl—as close as the AQ comes to the amenities of a classy joint. Dan and David kept the drinks flowing from the bar, while Jenn was maneuvering trays of glasses in and out of the miniscule spaces between tables. 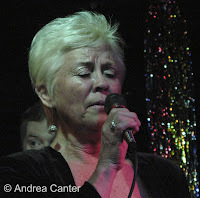 And onstage, Carole Martin sang ballads and blues as she’s been doing for nearly 70 years…and she’s been in her prime for most of them. She doesn’t miss a note, and she doesn’t let a lyric escape without her personal caress. It’s not the Vanguard. Or Cheers. It’s our little bit of heaven. Not just on New Year’s Eve. The Artists Quarter is in the lower level of the Hamm Building in downtown St. Paul, 408 St. Peter Street. Check the calendar at www.artistsquarter.com. Above photo: Carole Martin on New Year's Eve, photo by Andrea Canter.